Perception is everything. If you were asked to picture Austria in your mind, what would you see? Probably the pristine, snow-capped Alps that extend for over 500 kilometres down the west and south of the country. Hold this image, and then try to imagine what wine from this country would be like. You are probably visualising crisp, fresh wine; crystalline, like a stream flowing down the mountains. And you would be right. Austrian wine is all about purity. On a latitude between Burgundy and Champagne, but further inland, the wine regions in Austria benefit from the warm continental air blowing across from Hungary. Its warm, sunny summers bring out the aromatic character in the wine, and cool nights in autumn maintain its fresh, wet stone minerality; nothing is overblown. The vineyards are mostly located on the eastern side along the Hungarian, Czech, Slovakian and Slovenian borders, with the white wines being produced to the north of Vienna, and the reds south of the city. Charmingly, there are even 612 hectares of urban vineyards in Vienna. Wine production in Austria is small scale. Over half the growers work part-time in their vineyards as the plots, which have been handed down through the generations, are too small to provide a livelihood. But quality is paramount. In Austria, 21pc of all agricultural land is farmed organically and 13pc of vineyards are certified organic, which is a notably high percentage. Added to this, a minimum intervention approach is practised by two thirds of the vineyards, and strict regulations ensure that yields are kept exceptionally low. This means that Austria doesn't do commercial bulk wine at entry level prices. However, if you're prepared to spend just a little bit more, it really is worth it for the quality. As a rule of thumb, you just can't go wrong with an Austrian wine. And if you're looking for something really special, at the €30 to €50 mark, you are into world class quality. With 36 grape varieties permitted under the Austrian quality system, 22 white and 14 red, the styles are also influenced by the different terroirs, which range from the rocky Wachau Valley to volcanic soil, black earth, gravel, limestone and clay. There are a number of native varieties, and although many of them are lesser known, you have probably tried their very fashionable Grüner Veltliner, the white wine which is to Austria what Albarino is to Spain and Sauvignon Blanc is to New Zealand. 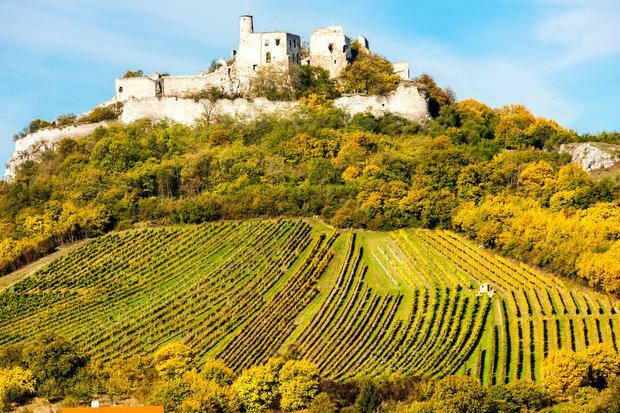 It accounts for a third of Austria's vineyards and is grown in Niederösterreich (Lower Austria) which extends from the Danube region to the Weinviertel. It is also grown in Vienna and Burgenland and displays a range of flavours depending on where it is grown and how long it has been aged. The native black-skinned grape varieties include Blaufränkisch, St Laurent and Zweigelt. Blaufränkisch, which is the most highly regarded of the Austrian red wine grapes, is a late-ripening varietal which has vibrant, deep forest berry fruit and a delicate spiciness. St Laurent is considered to be the difficult child of these three, but is starting to enjoy a renaissance with top winemakers, showing the potential this Pinot Noir-style grape has. And Zweigelt, which is a cross of Blaufränkisch and St Laurent, is a grape you may have come across as it has become more popular over the past few years. It's the most planted black variety, and can be made in styles that range from fresh, easy-drinking wines to more powerful, fuller-bodied wines which have been aged in oak barriques. With all the amazing Irish gins on the market, you could nearly forget that there's such a thing as vodka. Except not now. The Shed Distillery, who are behind the wonderful Gunpowder Gin, have just launched a very interesting vodka. Called Sausage Tree Pure Irish Vodka, it is slow distilled with Irish grain, wild Irish nettles, and fruit from the Kigelia Africana, also known as the sausage tree, which are hailed for their purification powers. Smooth and creamy, with just a hint of chlorophyll, serve it over ice with a premium soda and a wedge of orange. €43.95 in O'Briens and leading off-licences. Not from Austria, but from across the border in Hungary, this is dry and crisp, with refreshing flavours of citrus fruit and green herbs and the characteristic notes of white pepper and warm spice. Beautiful on its own or with Asian food. Seasonal, so buy it now. From the sunny Kamptal region of Lower Austria, this biodynamic white wine is a good example of the expressive Grüner Veltliner grape which is native to the country. It has the typical peppery note and a generous wash of ripe apples. This organic, wild ferment, zero sulphur Sauvignon Blanc from the Styria region in Austria is crisp and vivid with notes of dill and green herbs overlying rich complexity with hints of citrus and pear. Gernot Heinrich's vineyard in Austria has been certified biodynamic since 2009. Using indigenous grapes, primarily Blaufränkisch and Zweigelt, with a bit of St Laurent, this deliciously light red wine has vibrant cherry and red currant notes with just a hint of spice.